Take a look at this life insurance policy statement. It’s for a policy I took out on September 15, 2002. I’m showing it to you because I want put to rest the misconceptions and untruths the so-called financial “gurus” are spreading about the cash value growth of well-designed dividend-paying whole life insurance policies. The financial gurus tell you not to buy whole life insurance because your equity in the policy—your cash value—grows too slowly, and you won’t have any equity for the first few years. This is simply not true of Bank On Yourself-type whole life insurance policies! You’ll have cash value in the first year with a whole life insurance policy designed the Bank On Yourself way! See the date at the top of the statement? September 15, 2003. Compare that with the Policy Date on the third line of the Basic Section: September 15, 2002. That tells you this policy is exactly one year old. And according to folks like Dave Ramsey and Suze Orman, it’s much too soon for a whole life insurance policy to have any cash value. This policy already has $2,937 in equity (cash value) at the end of the first year! And this is not even a large policy. It’s a policy that was written with a death benefit under $250,000. In just one year, my cash value has grown to nearly $3,000! This is terrific, because if I need to get my hands on some money in a hurry, I can borrow 85% – 90% of my cash value immediately, using a Bank On Yourself policy loan, no questions asked. And the money will be in the mail to me or already transferred to my checking account within a few days—with just a phone call! Bank On Yourself-type policies build up cash value so quickly because of the special riders, or options, Bank On Yourself Authorized Advisors add when designing policies used for this strategy. Those riders supercharge the growth of your money—especially in the early years. Even the death benefit grows with a Bank On Yourself-type whole life insurance policy! In addition to claiming that it will be several years before you have any appreciable cash value in a whole life insurance policy, many financial advisors state that your death benefit—the insurance coverage itself—remains level throughout the life of the policy. I’ve showed you that a properly-designed dividend-paying whole life insurance policy—even a modest policy—can have thousands of dollars of cash value by the end of the first year. Now I want to show you that the “experts” are wrong about the death benefit, too. Take another look at the Summary of Policy Benefits section of the one-year-old policy at the top of this page. In just one year, the death benefit has increased by more than $8,000! I’ll explain how that happened in a moment. With Bank On Yourself-type policies—the high early cash value whole life insurance policies that Bank On Yourself Authorized Advisors are so skilled at designing—you can have cash value growth and death benefit growth in the very first month! There’s nothing magic about this, although the benefits to you are almost beyond belief. This kind of growth—of both cash value and death benefit—occurs because the policy is a dividend-paying whole life insurance policy, and because those dividends are used each year to fund the purchase of paid-up additions. Paid up additions are death benefit additions—which increase cash value as well! In dividend-paying whole life policies, dividends can be left in the policy to purchase additional coverage in the most efficient way possible. Also, a policy can be purchased with a Paid-Up Additions Rider (PUAR). Then much of your premium is funneled into the PUAR, which is the most efficient way to build cash value, because it channels most of that premium directly into the cash value portion of the policy, while purchasing only a small death benefit. Well over 90% of every PUAR premium dollar goes directly to building cash value. Very little goes to the cost of the death benefit. And only a tiny amount goes to the advisor as a commission. You can see that in the policy statement. The Paid-Up Additions Rider purchased $8,229 of additional death benefit just this year alone. And that additional death benefit also helped increase the cash value this year by $2,937. This is obviously not the type of whole life insurance Suze Orman, Dave Ramsey, and so many other financial entertainers talk about! They only discuss whole life policies in which the death benefit stays level for the life of the policy. But we have researched more than forty major life insurance companies and we couldn’t find any that still offer that kind of whole life policy. Suze and Dave, you just might want to update your talking points. 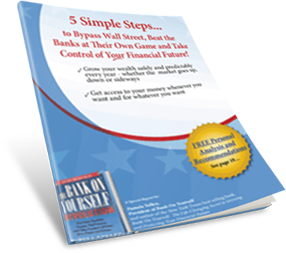 If you’d like to learn more about the many benefits of Bank On Yourself-type high early cash value whole life insurance policies, get your own FREE copy of 5 Simple Steps to Bypass Wall Street, Beat the Banks at Their Own Game and Take Control of Your Financial Future! 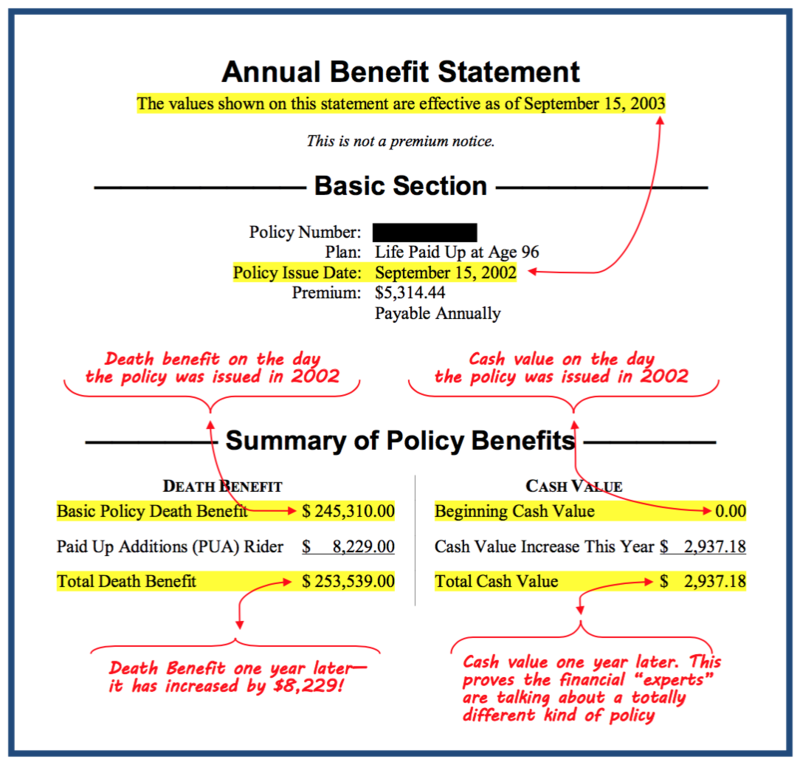 In this 20-page report you will discover all the benefits of high early cash value whole life insurance, explained clearly in easy-to-read English, not in hard-to-understand insurance industry mumbo jumbo. And your report will be delivered to you online, so you can download it and begin your eye-opening journey of discovery immediately. Remember—there is no cost or obligation when you download this free report. It is my gift to you. After you read my Special Report—maybe even before you finish reading it—you may be wondering if the Bank On Yourself strategy should be a part of your overall financial plan. We make it easy to find out, thanks to our network of professional Bank On Yourself Authorized Advisors. When you request a FREE Analysis, you’ll automatically get a referral to one of only 200 financial advisors in the US and Canada who have met the rigorous training and requirements to be Bank On Yourself Authorized Advisors. The financial professional you’ll be working with will review your overall financial picture to discover and show you the exciting ways you can benefit by adding this innovative but proven 160-year-old safe wealth-building strategy to your financial portfolio. So request your Free Analysis and Personalized Solution today! Have you ever been told that while a life insurance company will pay your family a death benefit when you die, they will keep your cash value? That’s why some people say they would never buy a whole life insurance policy—even if their life depended on it! But in Part 2 of this two-part series, we’ll show you proof that your loved ones can actually receive more than the original death benefit plus the cash value, at the time of death! Read What the Experts Don’t Know About Bank On Yourself, Part 2. Would this program be beneficial to a couple that is going to retire in 8 mos? People of all ages can – and do – use this proven wealth-building method. And there are special Bank On Yourself programs available for folks who are age 60 and up. To learn more about those programs, check out the two videos and transcript here. If you are interested in this strategy and would like to find out if you qualify for it and how you could benefit from it, given your unique goals, circumstances and dreams, why not take advantage of a no-obligation Bank On Yourself Analysis that will help you get those answers? You can request it online here.